Land shortage in Hong Kong is severe. It is reflected in the rising price and rent of not only of residential premises, but also commercial, office and other spaces. Indeed the expensiveness of non-residential space has risen even faster than residential space. Finding land and supplying them to meet the full range of development needs is an urgent task. 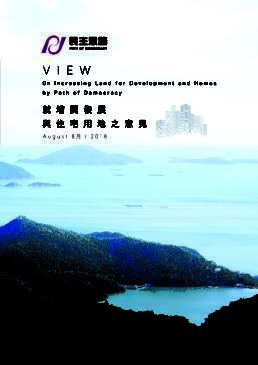 The report of the Task Force on Land Supply and the subsequent consultation exercise should be an important step in helping to identify sufficient land and finding the appropriate mix and location of land to meet Hong Kong’s future development needs. To do so, a vision of Hong Kong’s future has to be articulated together with the tradeoffs that have to be addressed. Only then will the public be able to engage in meaningful debates over the pros and cons of genuine alternatives. This has sadly not taken place. Our accommodation standards have fallen backwards. Whether this should be remedied has implications for our land strategy. Our social and economic development will be better served if future land supply improves the spatial distribution of homes and jobs. Land supply has been highly inelastic in most metropolitan centers and is often the root cause of sharp increases in prices and rents. The policy challenge is to speed up land formation using a flexible and effective range of policy tools, to streamline approval and regulatory processes in land formation. In this paper, we spell out our views on land development. In our view, Improving accommodation standards for both residential and other uses of space should be part of our vision. In this respect, reclaiming land, especially an island to the east of Lantau Island, should be a vital element of Hong Kong’s future social and economic development. However, developing agricultural land in the New Territories should continue to be an important part of development strategy. We believe such a vision is that of the people of Hong Kong and our government. And we call upon the government to articulate them and work with the people to realize such a shared vision.